The burrowing owl (Athene cunicularia) is not your typical owl. One of Florida’s smallest owls, this species stands only at an average height of nine inches tall. This small owl with long legs and brown body with speckles of white also spends most of its time on the ground instead of high on a tree branch looking for prey. Also unlike most other owls, the burrowing owl does not have ear tufts or is particularly nocturnal. Burrowing owls are mostly active during the day and live in open habitats and hunt close to the ground. They prey on various insects and animals like grasshoppers, beetles, roaches, crickets, lizards, frogs, snakes, birds and rodents. Named for their ability to burrow underground to build their own homes, burrowing owls have also been known to live in burrows dug by other animals. Interestingly, juvenile owls – owlets – are able to scare away predators by hiding in their burrows and imitating the sounds of a rattlesnake. Burrowing owls, like most other owls, rely on keen eyesight to locate their prey even in dark conditions. An uncanny ability to have directional hearing also helps locate hidden prey. 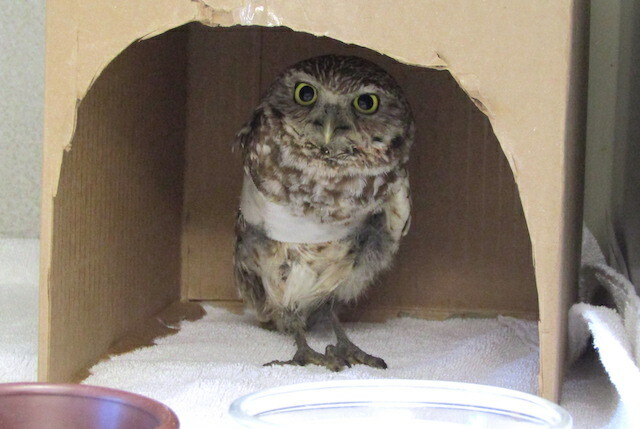 At CROW, an adult burrowing owl was admitted to the clinic from Cape Coral after it was discovered on a person’s screened porch with an apparent injury. During its intake exam, veterinarians noted the patient to have mild, wispy hemorrhage from the posterior chamber of one of its eyes, a closed right humerus fracture that was very close to the shoulder joint, while its feet were covered in dried/caked dirt. Due to the proximity of the fracture to its shoulder joint, the patient was deemed not to be a candidate for surgical repair. Instead, it was placed in a body wrap to immobilize the wing. 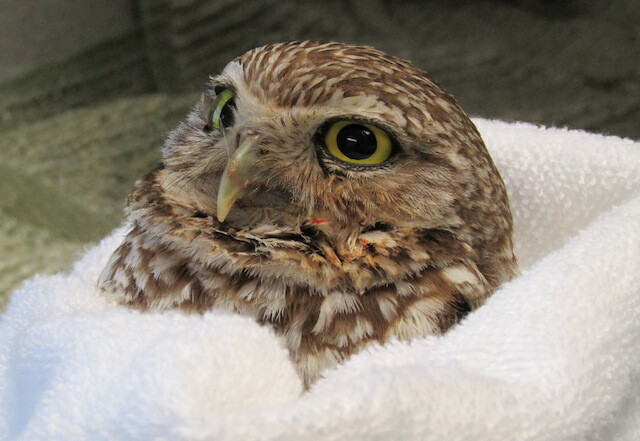 The owl was provided with pain medications and its feet were cleaned. “The wing will be stabilized in a wrap for at least three weeks, with physical therapy every three days, while it heals,” said Dr. Bast shortly after the patient’s intake. The eye injury was not believed to be serious. “The hemorrhage in the back of the eye was mild and resolved within a few days. Since the eye is such a large part of a bird’s skull, when they get head trauma they often have secondary eye damage as well. In the case of an owl that also hunts by hearing, it can usually still survive if it only has sight in one eye. This bird was on anti-inflammatory medication for the eye,” said Dr. Bast.